So what's up with these new inspection rules? 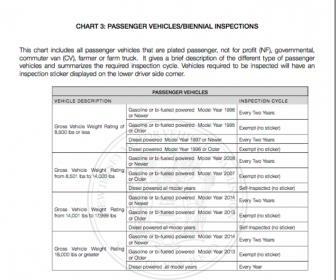 Apparently passenger diesel trucks need to have log books now for self inspection? Where can I find the information you posted above about the Log Book for diesels without inspection stickers? Thanks for posting. I'm not really sure lol. I've googled it a few times and can't seem to find anything. There are websites that sell log books, but I don't know if that's what NJ wants since NJ likes to do things their own way. Probably best to call the DMV and see what they say. Pretty sure nothing has changed for us. You are always supposed to so call "self insepct" your vehicle to make sure it is road worthy and safe. I recently registered my truck and noone said anything about needing to get it inspected etc. I don't think much will come of it. Seems silly to have log books for noncommercial vehicles. I have a friend who talked to someone he knows in the DOT and he said that log books are now required and the DOT can stop people at any time and ask for them. I don't see that happening. Plus half the people who own these vehicles won't be aware of the new requirements. I'm not going to bother carrying log books around. So what's up with these new inspection rules? Apparently passenger diesel trucks need to have log books now for self inspection? I don't think much will come of it. Seems silly to have log books for noncommercial vehicles. I have a friend who talked to someone he knows in the DOT and he said that log books are now required and the DOT can stop people at any time and ask for them. I'm not going to bother carrying log books around. Your typical LEO could probably care less, however, if a Traffic EO or Statey has reason to pull you over he will have a plenty of fines for you. It helps pay his salary. So basically if you’re tagged commercial, over 10,000 pounds, and for personal use, you’d best have your log & documents available and up to date. 2016 Longhorn 3500 4x4 short-bed in Pearl White. Cummins-AISIN, CrewCab, SRW, Ride-Rite remote rear air suspension, Edge CTS2, plus the typical after-market bolt-on crap. *Hauling a 2017 Northstar Arrow-U. What if your not tagged commercial but registered over 10,000 lbs? If you are diesel powered from 10,000 to 17,999 pounds then you do NOT need an inspection sticker but you do need to carry an inspection log. You have the best scenario: Passenger plates, over 10,000#, diesel powered. In your case You are also exempt from commercial vehicle highway inspection stops too! So do we have to do emission tests or are we exempt from that cause I’m trying to decide to delete or not delete. 2016 ram 2500 Laramie diesel window tint, 35w hids lowbeams, led fog lights. I’m registered passenger vehicle 10k. Is that good?